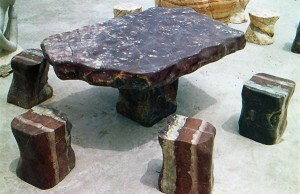 Tables for inside, outside, garden or poolside, any design is possible with GFRC from Stromberg. Glass fiber reinforced concrete is the perfect choice for tables located in the great outdoors because it requires very little maintenance. Wash GFRC tables with mild soap and water and reseal them annually and they can last for generations. Stromberg has provided tables in GFRC for hospitality, government and resort locations all over the world. GFRC is an extremely durable material that stands up to the elements, including rain, sunlight and even hurricane force winds. Stromberg is the leading manufacturer of glass fiber reinforced concrete designs and they have the ability to craft amazing tables for any location. Stromberg offers their clients undivided attention and no detail will go unnoticed. Stromberg is the pioneer in glass fiber reinforced concrete manufacturing technology. Stromberg is committed to responsible manufacturing and GFRC is an environmentally friendly material. GFRC is Stromberg’s most popular material and they’ve used it to create beautiful buildings all over the world. You’ll have the largest design selection anywhere to choose from. Stromberg Architectural Products offers initial consultations and quotes free of charge. Stromberg GFRC is known for its adaptability in color, texture and shape. The design possibilities are limitless. GFRC by Stromberg weighs less than precast concrete, making your structural framing simpler and your foundation costs less expensive. Glass fiber reinforced concrete is an energy efficient material. Stromberg GFRC provides maximum project flexibility due to their unique manufacturing process. The team of experts at Stromberg Architectural give their clients high quality service, coupled with unparalleled technical expertise. They’re known for a commitment to excellence in whatever size project they take on. Bring them your ideas and they’ll work to make sure your final product is state of the art. Contact them today at 903-454-0904 for your free custom quote, and experience the benefits for yourself.